The Key Elements for Christian Excellence in the Home - Who can expect amazing success in their family? Let me begin by congratulating those individuals and families who are experiencing so much success in reading God's Word and incorporating the commands into their families. No family should expect great success in the Christian experience if fathers are not leading in family worship and mothers are not acting as suitable helpers towards this end. In distinction, parents who make the Sacred Scripture a sincere priority (1) as the considerations of the mind, (2) as the meditation of the heart, and (3) as the standard for behavior, these parents should expect successful children who continue to walk with God. People naturally lean towards evil. Unbridled childhood brings childish folly; adulthood brings brazen defilement. But, how do you direct a child after he or she is beyond your oversight and teaching? How can you prevent your children from departing from righteousness against all your God-honoring values when they are free to do as they wish? Answer: Diligently invest the Holy Bible into their lives daily. and when he is old, he will not depart from it" (Pr. 22:6). 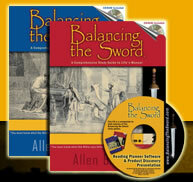 In truth, Balancing the Sword (as with any training resource) can become mechanical, offering little benefit. The key to amazing success is authentic family worship by fathers and mothers teaching and praying with their children, living the faith in daily situations, praising the Lord in word and deed. BTS is a useful tool, but is far from the sum total of "family worship." All parents who diligently teach our faith, with sincerity and exemplify a matching lifestyle, should expect great success no matter where they live or if they use BTS or not. In the final analysis, parents expect wrongly if they hope to enjoy great success while neglecting the commands for family worship. It would be equally as foolish to expect a great marriage without sweet-talking your spouse as exemplified in the Song of Solomon. Whether the goal is excellence with children, in marriage, at work, in friendships, we cannot omit major elements of a biblical formula and expect the same results.